Western nations back Israel's right to self-defense, urge Egypt to persuade Hamas terrorists to end rocket attacks from Gaza. Western nations on Friday pushed Egypt to persuade Hamas terrorists to end rocket attacks from Gaza and backed Israel's right to self-defense, AFP reported. 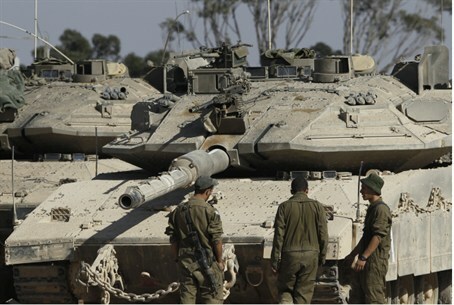 The West stressed the onus was on Hamas to halt rocket fire into southern Israel, said the report. "Israel has the right to protect its population from these kinds of attacks. I urge Israel to ensure that its response is proportionate," European Union foreign policy chief Catherine Ashton said, according to AFP. She echoed hopes that Egyptian Prime Minister Hisham Qandil, who crossed into Gaza for a brief visit Friday, "will be able calm the situation." Washington has reached out to Egypt's new leaders as well as to allies such as Turkey to use their sway with Gaza’s Hamas leaders. U.S. Secretary of State Hillary Clinton, who is traveling in Asia, has spoken twice with her Egyptian counterpart, Mohammed Amr, since the start of the operation, with the second conversation taking place after Qandil's Gaza visit. "In all of the conversations that she has had... we all agree on the need to de-escalate this conflict," State Department spokeswoman Victoria Nuland said. Clinton was also expected to be in contact with "countries with influence, to try to maximize the pressure we can bring to bear on Hamas to cease and desist," Nuland added. She again stressed the U.S. position that "Israel has a right of self-defense" and refused to be drawn on reports that the Israeli army was preparing for a ground operation in Gaza. Speaking at Gaza City's Shifa hospital during his visit, Qandil vowed to step up Cairo's efforts to secure a ceasefire. "Egypt will not hesitate to intensify its efforts and make sacrifices to stop this aggression and achieve a lasting truce," he told reporters on Friday. Egyptian President Mohammed Morsi also branded Israel’s Operation Pillar of Defense as a "blatant aggression against humanity," the official MENA news agency said. Morsi vowed that "Cairo will not leave Gaza on its own." Egypt, which in 1979 became the first Arab country to sign a peace treaty with Israel, often plays a mediator role between Israel and Hamas, and Morsi has been fielding calls from world leaders over the rising violence. French President Francois Hollande expressed "deep concern" in a phone call with Morsi and "stressed the role Egypt could play to cut the tensions," the president's office said. Russian President Vladimir Putin also told the Egyptian leader that Moscow supported Egypt's efforts to halt the violence, the Kremlin said. Saudi King Abdullah, whose country is a heavyweight in the six-nation Gulf Cooperation Council, told Morsi "that things must calm down and reason and wisdom must reign over passionate reactions," the state news agency SPA said. Meanwhile, Turkish Prime Minister Recep Tayyip Erdogan once again attacked Israel on Friday and accused Israeli officials of ordering the air strikes as an electoral move ahead of January's vote. "Ahead of this (new) vote, the current leadership once again chose the route of striking these innocent people of Gaza for made-up reasons," Erdogan said, according to the Anatolia news agency. Pakistan also condemned the Israeli air strikes on Gaza and vowed to stand by the people of Palestine against "Israeli aggression," branding it a violation of international law, AFP reported. Jordan's King Abdullah II told Clinton in a phone call that he was "deeply worried" about Israel's air strikes, a palace statement quoted by AFP said. "Clinton telephoned the king, who said he was deeply worried about the dangerous repercussions of Israel's aggression on Gaza and its impact on the region," the statement added. The king, whose country has a 1994 peace agreement with the Jewish State, "warned against Israel's military escalation, stressing that more international efforts are needed to stop it," the palace said. Hamas terrorists continued their rocket attacks on Israel on Friday. According to statistics published by the IDF, since the beginning of Operation Pillar of Defense more than 550 rockets and mortars have been fired at Israel. The Iron Dome system intercepted more than 192 rockets, and recorded an 85% success rate. Rockets were also fired towards Jerusalem, hitting Gush Etzion, just south of the city. There were no physical injuries or damages.